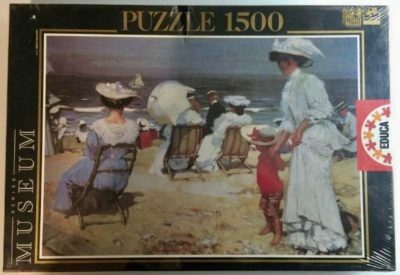 Educa manufactured this beautiful puzzle in 2002, although there is a later version in 2005 in a black box. The title is Ulysses and the Sirens, by Herbert James Draper. There is another version by Anatolian that is easier to find. The puzzle depicts the scene from Homer‘s Odyssey in which Ulysses (Odysseus) resists the bewitching song of the Sirens by having his crew tie him up. At the same time, they are ordered to block their own ears to prevent themselves from hearing the song. There is at least another puzzle with a scene from the Odyssey: The Return of Odysseus, by Pinturicchio.